Austin, TX own RUN DMT’s sound is a reflection of a torrid love affair with heavy basslines, thunderous beats, and haunting melodies. Forming in the summer of 2010, RUN DMT decided to take the approach of no-holds-barred heavy bass music without borders, touching on Dubstep, Drumstep, Moombahton, UK Funky, atmospheric Downtempo and more. In its short 1.5 year of history it has made high profile appearances at Camp Bisco, Nocturnal Festival, Bass Invasion, and Snowglobe Music Festival. Its original productions and remixes have become recent playlist staples for DJs ranging from Bassnectar to MSTRKRFT to Craze to 12th Planet and beyond. RUN DMT’s first official release on Play Me Records shot straight to the TOP TEN on Beatport with “Drop Top” hitting #2 on the Drum & Bass Charts, and “Bro 2.0” hitting #3 on the Dubstep Charts. 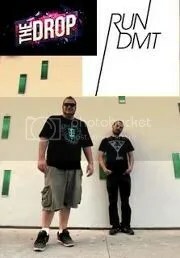 RUN DMT has released tracks on JFK’s Teenage Riot Records, Evol Intent, T&A and Heavy Artillery, and are featured on the soundtrack for the video game, “Mortal Kombat” (2011). RUN DMT has also remixed for the likes of Bird Peterson, Asking Alexandria, and Figure. The debut full length album “Union of Opposites” to be released in June 2012 on Play Me Records worldwide and will feature the likes of Chali 2na, Dj Swamp, and more. Posted on August 7, 2012, in DUBSTEP, EVENTS, TRUE PTODUCTIONS. Bookmark the permalink. Leave a comment.